It’s the most wonderful time of the year! For birders, that is. Especially in Oakland. Bird-lovers will roam across the East Bay on Sunday, counting shorebirds, raptors, water birds, and songbirds — anything with wings. 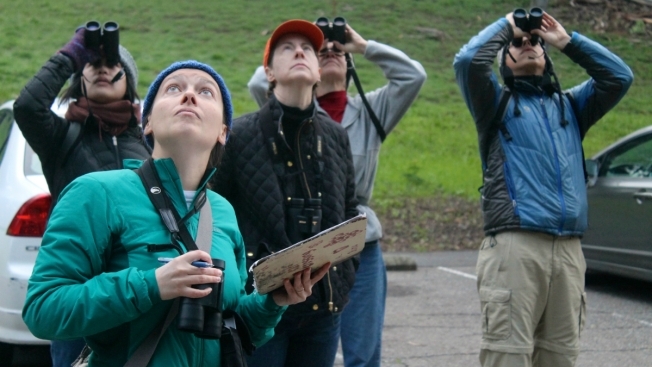 According to the Golden Gate Audubon Society, Oakland’s 76th annual Christmas Bird Count on Sunday, December 18 will be the largest in the world with more than 270 volunteers, from novices to experts, pre-registered for the all-day count. Last year’s event had 314 birders, more than any other local bird count in 2015. Despite wet weather, the volunteers spotted 96,287 individual birds representing 179 species in one day. Cindy Margulis, Executive Director of Golden Gate Audubon Society, said the national Audubon Society tallies participants and birds from all chapters. If all the registered participants show up on Sunday, Oakland will likely be the largest in the wold world. The San Francisco Christmas Bird Count will take place on December 27. The volunteers spend a full day from dawn to dusk counting anything avian within a designated 15-mile circle. Scientists and policymakers use the data to research population trends and protect at-risk species. Birders are eager to see if growth trends continue for local populations of American crows, common ravens and wild turkeys. They’re also eager to spot a tricolored blackbird, because the species has lost habitat in the Central Valley and is in decline across the state. The tradition of counting birds at the holidays goes back to 1900, when New Jersey conservationist Frank Chapman proposed as a more humane alternative to shooting birds as part of a Christmas hunt. Birding is a popular hobby in the Bay Area because there are so many great places to bird, said the Golden Gate Audubon Society spokeswoman Ilana DeBare. After the count, the birders will celebrate and compile their numbers at a festive dinner in Berkeley.